Welcome to the 'Trip to Japan' travel blog! I'm Eric and in 2011, 2012, 2013, 2014 and 2015 my girlfriend Kate and I travelled to Japan from Australia and each time spent a very enjoyable three weeks experiencing the many interesting activities and sights on offer. After each trip (apart from the first) I've been writing about our journeys on this blog, and this post is a summary of our 2014 trip. I'd like to thank everyone who has been following along, especially those who have left comments, and would also like to welcome any new readers interested about Japan! As a bit of an update on what's going on with my life: at the moment I'm studying a Master of Information Technology. This the main reason the blog posts are coming out a lot slower than they did in the past. Also, I've been learning Japanese these past few years and at the end of this year I plan to take the Japanese Language Proficiency test N1 (hardest level). From there I believe there's still a long road to full fluency but I'm making progress! At the moment I'm focussing on the JLPN N1, and increasing my vocabulary from ~12,000 words to ~20,000. Even learning 10 new words each and every day this is going to take a couple of years! As an aside, our next trip is to the USA in January/February of 2016, so hopefully I'll be able to finish writing about our 2015 Japan trip before we go again! Maybe I'll even have time to write about the 2011 trip? Anyway, the following is a quick description of each day of our 2014 trip with links for those who want to click through to read the whole novel (or just look at the pictures). You can also access each day using the links in the side bar. Finally, there are summaries like this of both the 2012 Japan Trip and the 2013 Japan Trip. This is rationalisation of our 2014 trip as well as an overview of our plans. It's a bit similar to this post actually. After arriving into Narita Airport, we checked into our hotel where we found a package waiting with our pocket WiFi as well as a letter containing concert tickets for tomorrow’s ZAQ live event! In the morning we went to Ginza and bought a bunch of clothes from the flagship UNIQLO store. In the evening we travelled to nearby Kawasaki city for our first concert in Japan: ZAQ's First Live 2014 at CLUB CITTA! Today we looked around Tokyo. In the morning we went to Kappabashi which is a huge shopping district that sells everything you'd need to open and run a restaurant, apart from food; from signs, knifes, ticket vending machines down to the display food seen outside of shops! Very relevant to Kate's interests. 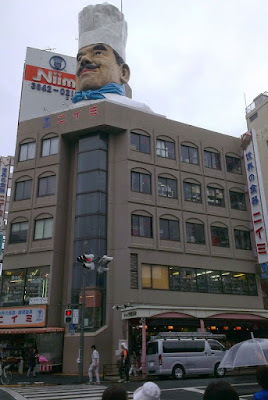 In the evening we had a look around Akihabara, which is Tokyo's home of electronics and anime/manga. Today was a day trip out to climb Japan's tallest mountain, Mount Fuji! It was a long day, a huge climb and a gruelling trip back down! We'd like to go back again sometime and stay overnight near the top so we can see the sunrise. Another day trip from Tokyo, though this time to the less exhausting location of Tsukuba City! There we visited the Japan Aerospace Exploration Agency (JAXA) headquarters, had a tour of some of the facilities used to train Japan's astronauts and then had a look a hanger full of satellites. I bought a meteorite at the gift shop and in the afternoon we returned to Tokyo and went to Ikebukuro for some Karaoke! Leaving Tokyo for the last time this trip, we caught a shinkansen to Gunma Prefecture and then a bus to Takumi no Sato, which is an old style town where you can enjoy traditional Japanese handicrafts. We made some washi paper, painted some nuts, and then made and ate soba noodles! In the afternoon we continued on the town of Minakami for a stay in a traditional Japanese inn (Ryokan). We enjoyed a soak in an onsen (hot spring) and then had an amazing buffet style ryokan meal. Everything was really high quality and delicious! This morning we had another delicious buffet for breakfast, and then caught a train down to Doai Station. Doai is famous for being the deepest train station in Japan, located an impressive 70 metres below the earth! After that we wanted to get a ropeway up Mount Tanigawa, but found it was closed due to the bad weather caused by an approaching typhoon. So, instead we caught a bus back and spent the rest of the day wandering around Minakami Town. In the evening we had another fantastic buffer meal at our ryokan but this time we paid a small amount for 90 minutes of all you can drink! This included, sake, whisky, wine and sours (a mixed drink). We probably enjoyed the sake a little too much! Today we left Minakami on a train to Kanazawa on the western coast of Japan. Upon arriving we checked out the Omicho Markets, then visited a traditional Japanese sweet museum where we enjoyed a sweet and some macha (green tea). In the afternoon we then toured the East Tea house district where we visited lots of shops specialising in goldsmithery and craft. We ended the day with a visit to Kanazawa Castle and Oyama Shrine. We hired a car from Kanazawa today and went for a road trip out to the Noto Peninsula. There we enjoyed driving on the beach, visited some temples and shrines, and enjoyed some really cool cragged coast line. Later in the day we visited the very scenic "two thousand rice fields" of Senmaida and continued on to the lighthouse at the tip of the peninsula before returning back to Kanazawa. This morning we checked out of our Kanazawa hotel and drove down to see the sights around Kaga Onsen. This included the Shirayamahime Shrine, an insect museum, and a ropeway up to the Shishiku Highland, which was a creepy place in the fog. We then visited the really nice Tedori gorge and had a rest next to a waterfall, before hopping back in the car to drive along the Super Rindo Road where we enjoyed lots of waterfalls and mountain scenery- including a short mountain hike! In the evening we returned to Kaga Onsen and enjoyed the onsen, and an in-room kaiseki meal at a ryokan in the town of Yamanaka Onsen. Today we drove down to Fukui prefecture to visit the Eiheiji Temple and Japan's best Dinosaur Museum. We then returned to Kaga to visit Natadera Temple and have a quick look at what was thought to be the world's oldest business (they found a slightly older one), the 2297 year old Hoshi Ryokan. After that we enjoyed another onsen and kaiseki meal at our ryokan in Yamanaka. In the morning we checked out of our ryokan and journeyed by train down to Kyoto. There we caught a bus out to have a fantastic personal (just four participants) lesson in Japanese cooking at the house of a really nice Japanese lady. In the evening we then went out to enjoy the night food stalls and atmosphere of the Gion Matsuri which is Japan's most famous festival. We lingered in the boiling heat of Kyoto today to see the float procession of the Gion Matsuri. During the wait I enjoyed many cups of shaved ice. After that we then caught a highway bus across to Takamatsu, which is a city in Shikoku, Japan's smallest main island. This morning was our first in Shikoku, and we set about exploring the town of Takamatsu. After having a look at a rare example of a seaside castle we then caught a ferry across to the tiny island of Megijima and hired some electric bikes. The bikes were a lot of a fun and allowed us to effortlessly climb to island's highest point where we found a fantastic view of the Seto Inland Sea and a really cool cave formerly used by pirates and ogre. Back in Takamatsu city we had a look at the new development around the train station and then the Ritsurin Koen garden, which is number four of Japan's three best gardens. Today we left Takamatsu on a journey down to Saijo. Along the way we stopped off at Marugame station, hired some bikes and rode to the town of Kotohira which is most famous for being the location of Kompirasan Shrine which, with a total of 1368, has even more stairs on its approach than the famous Yamadera temple! After slogging up Kompirasan Shrine we enjoyed Sanuku Udon back at the bottom and then rode to Zetsuji Temple, which is famous for being the alleged birth place of Kobo Daishi. There we enjoyed a dark tunnel under the main temple building before riding back to Marugame, visiting an art museum, and completing our journey to Saijo. The reason we had come to Saijo was so we could today climb Mount Ishizuchi or Stone Hammer Mountain. This is Shikoku's tallest mountain, one of the holiest, and is known for the pilgrimage up containing a set of harrowing metal chains that you use to pull yourself up the sheer cliff face. The third set of chains was definitely the main event! At the top we enjoyed some precipitous views and then climbed back down and caught a train to Matsuyama. This morning we visited Matsuyama Castle which is one of Japan's twelve remaining original castles and due to its size and complexity is one of the best in the country. We caught a chairlift up, had a look at the buildings, enjoyed some shaved ice, then returned back down and drove a rental car out into the mountainous countryside, along some really narrow roads, to the Shikoku Karst landscape area. After enjoying the limestone, cows and windmills we then drove down to the small coastal city of Uwajima and visited a fertility shrine. Today we drove down to Kochi which is a coastal town located on the pacific side of Shikoku. There we went to Mount Godaisan for some views of Kochi, a pretty good botanical garden, and a visit to the Chikurin-ji temple. This morning we drove to the Ryugado Cave system which are one of the best three caves in Japan. There we spent some time exploring the relatively narrow but very long publicly accessible cave route where we saw speleothems and a 2000 year old pot dating from the Yayoi era. After the caves we then made our way to the hidden valley of Iya. Along the way we stopped at a rest house along the Okabe Gorge where we enjoyed a Japanese Folklore and geology museum. Upon arriving in Iya Valley we had a ride on some ladybugs, visited the famous peeing boy statue and walked across one of the vine bridges suspended across the river. In the evening we checked into a Ryokan and enjoyed a relaxing onsen and delicious kaiseki dinner. We visited the other side of the hidden Iya Valley today which we accessed by driving along a little road dotted with small villages along the river. Our first stop in Oku-Iya was a pair of vine bridges and a wild monkey bridge. We crossed both vine bridges and I had a go pulling myself across the gorge in the wild monkey bridge. We then drove, and then climbed up Mount Tsurugi or Sword Mountain, which is the second highest mountain in Shikoku and a counterpart to mount Ishizuchi we'd climbed earlier. The climb up was a lot easier though, as we caught a chairlift most of the way! After enjoying the views we then drove down to Tokushima city and enjoyed a night performance of the famous Awa Odori dance. Our last full day in Japan was spent in the morning at Naruto, which is famous for its whirlpools. The vortexes appear when water is exchanged between the Pacific Ocean and the Seto Inland Sea during the changing tides and just happened to be at their best when we were visiting! After touring out to the maelstrom via boat, we then returned to Osaka by bus and that night enjoyed the night stalls, float precession, fireworks and boats of the Tenjin Matsuri, which is one of Japan's three greatest festivals! Just a short entry for today, covering our trip to the Den Den electronic Town in Namba, Osaka and our flight home. We had a wonderful time in Japan once again, and I hope I've been able to successfully share our experiences and encouraged you to visit! If so, I'm sure you'll have a wonderful time! I've loved travelling around this wonderful country with you. our son who has lived and worked near Kagoshima for two years is now back in the UK and going back to university. He hopes to return to Japan to work in the future.